There is nothing more enjoyable than spending time in a bookshop, leafing through books and dipping into the first few pages to discover what lies within and what new adventure will present itself. I like the structure of the novel; the beginning, middle and end, travelling down the narrative road and becoming friends with the characters and anticipating the plot ending. Along the journey, I create landscapes, portraits and interiors in my mind’s eye – glimpses of what the characters look like and where they live. These images, like dream sequences garnered from my memory are fleeting, a jumble of places and people. It is a collaborative process where the author brings the words, and I provide the visuals. It is a linear process, starting on page one and finishing with the final full stop. Photobooks work for me in a very different way; I dip into the pages and submerge myself in the possibilities of new ideas and new stories. I like the process of getting to know the photographs, reading them as single images and also as sequences that are part of a greater whole. It is a multi-layered visual experience, which once completed offers as much as the novel does but is an entirely different experience. The photobook responds best to an investment of time and an almost osmotic absorption of the photography and the story the photographs collectively tell. I rarely start on page one and follow the logic of turning page after page until I reach the final full stop. I approach photobooks in stages; picking them up, putting them down, starting in the middle, at the end, flicking through the pages. I go backwards and forwards, slowly discovering more on each visit. As with the novel this is a collaborative process. I provide the words while the photographer provides the imagery. Book in hand, I began perusing Elementary Calculus by J Carrier by flicking the pages backward and forward, randomly letting a page fall open, hovering over a photograph, looking to see if the images were interesting and worth further investigation. 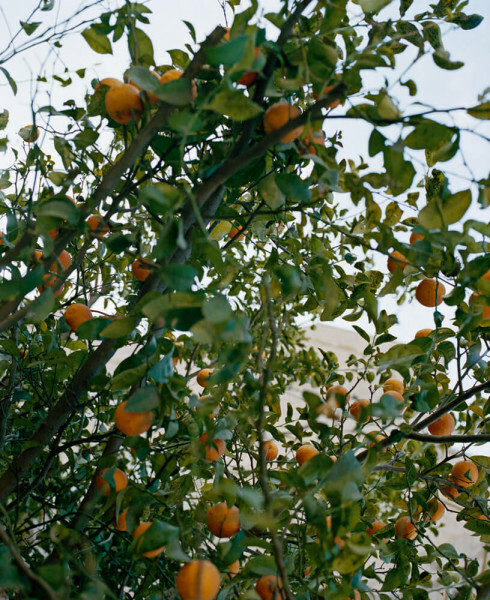 On first opening Elementary Calculus I saw bright sunlight, lemons, streets. I thought this was a book of random images, conventional snapshots of memory. Nice photographs but familiar and then I spotted a pair of images. It was the conversation between these two photographs across the book’s spine that intrigued me. A photograph of birds perched on telegraph wires sat opposite a photograph of a man’s arm with a tattoo made up of words. I was curious about the dialogue between these two images. Could the wires be the staves of a musical score and the birds, notes on the stave, music for the lyrics imprinted on the man’s arm? Was this the implied connection? I continued to flick and found another pair of photographs, a mass of wires and phone parts laid out on a cloth facing a photograph of pigeons scattered on the pavement, picking at bread. The visual similarity, in pattern and tone was clear to see, even if the meaning of this relationship still needed eking out. I was hooked. Here was a photobook that, whatever else it would turn out to be, was led by a visual impulse. More than the show and tell tactics of the documentary genre, this was photography that was using the poetry of visual language to tell its story. Narrative photography is fixed within the real world. We recognise what it shows us. But simply knowing that a pigeon is a pigeon and a telegraph wire is a telegraph wire, does not help us necessarily understand what lies behind Elementary Calculus. So I opened the book again and started once more to look at what J Carrier had photographed and in particular how the photographs were sequenced. If we do not read the signs properly we can be misdirected. It is easy for our brain to make assumptions about important parts of a scene. The title of the book and the bleached sunlit photographs came together to suggest that this was America, maybe the Texas border or even California. Actually the exact location was not of much concern to me. I was more interested in working out the story. A number of motifs were running through the pages: stray cats walking along sunlit walls were repeatedly interspersed with phone boxes; some in use, others empty with the handset left dangling. I began to fill in the conversations that the characters were having and imagined who was left on the end of the line and why their telephone call had ended. I noticed for the first time the book ends. 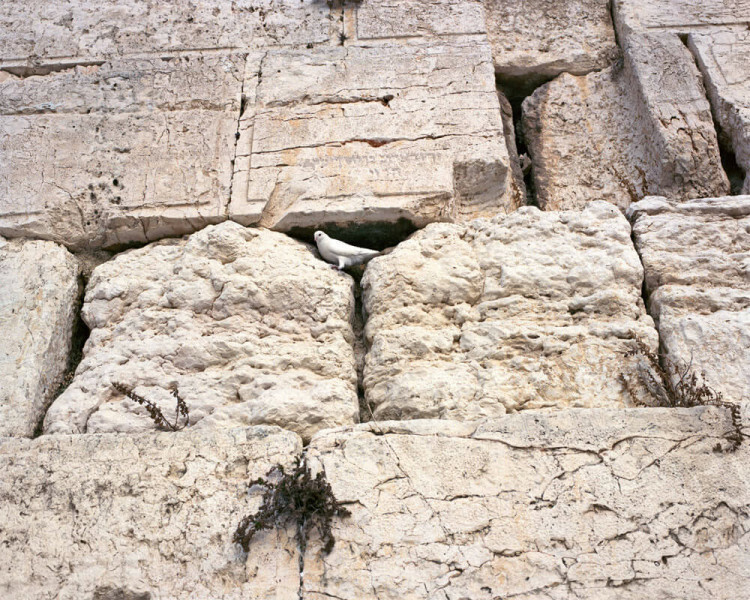 The photographs at the beginning and end of the book were of a repeated stone wall with a white bird nesting in the crevice. I liked the way the birds were positioned so they looked into the body of the book, suggesting everything I needed to know lay between these two photographs. The cats and the phone boxes proposed a transitory life lived on the streets, without a fixed location. In a world where everyone is connected via mobile phones, the use of phone boxes took on a significance, begging the question – why were people using them and who were they calling? And so I had begun to build up a picture of a warm place, where people were living a transitory life. Maybe they were refugees or migrants? It seemed clear that there was a sense of disconnect, of somehow not belonging. But there was one image that jarred. It did not seem to belong to the warm streets of America that I thought I recognised. The photograph was of a young man leaning against a wall, hat on his head. 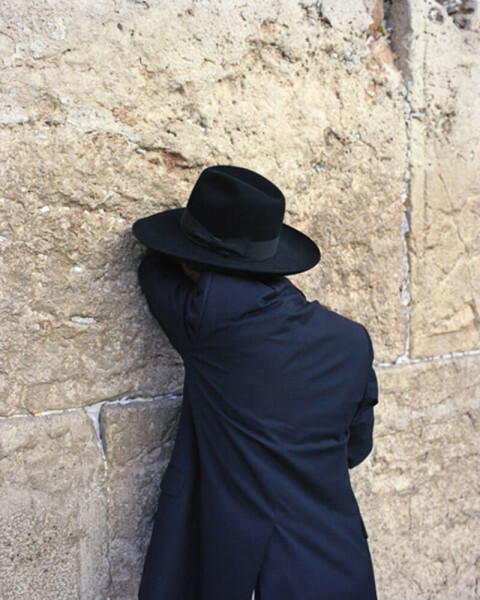 The proximity of his body to the wall suggested a mournful posture, perhaps even crying and suddenly I realised that this was not America but Israel and that this must be the Wailing Wall – a site for Jewish prayer and pilgrimage for centuries. I felt simultaneously stupid and elated. I had cracked the code and could go back into the story and look with fresh eyes. And yes all the clues were there. Where I had casually assumed the phone boxes were American, closer inspection revealed Hebrew script on the keypad. Company skyscrapers, letters on the money notes, graffiti on the wall, details in the wrought iron gates, posters on the bus shelter all revealed their location, probably Jerusalem or maybe Tel Aviv, but certainly Israel. And so the story of Elementary Calculus took on a political edge. The characters, seemingly not Israeli and not obviously Palestinian did not fit in the location they found themselves. Unlikely to be refugees, they would appear to be migrant workers, living on the edge of the society they found themselves in, calling home to their wives, girlfriends, mothers. 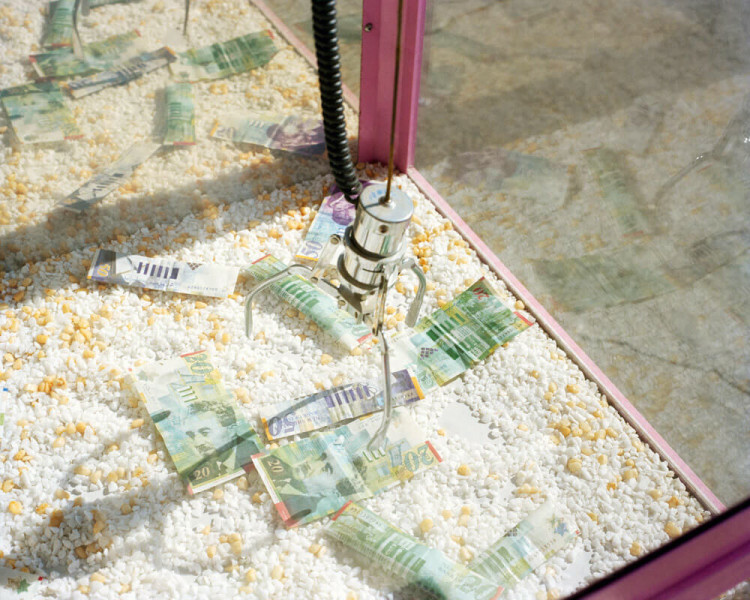 Snatched conversations that could only last as long as the money would allow. 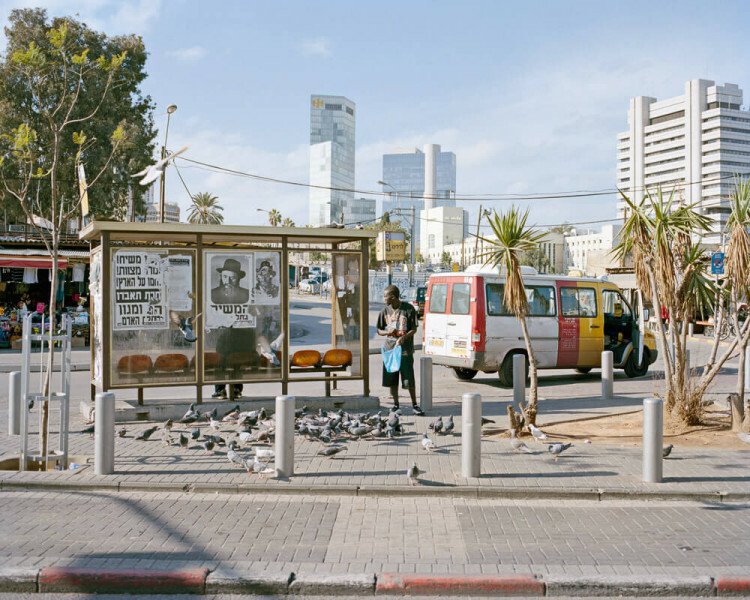 This Israel is different from the one with which we are so familiar through its representation in the mass media and forms of visual culture. Here we have the story of the migrant worker, scratching about for work, always on the move, looking for ways to exist in a world where they do not belong. J Carrier was born in 1974 in Biloxi, Mississippi, USA. 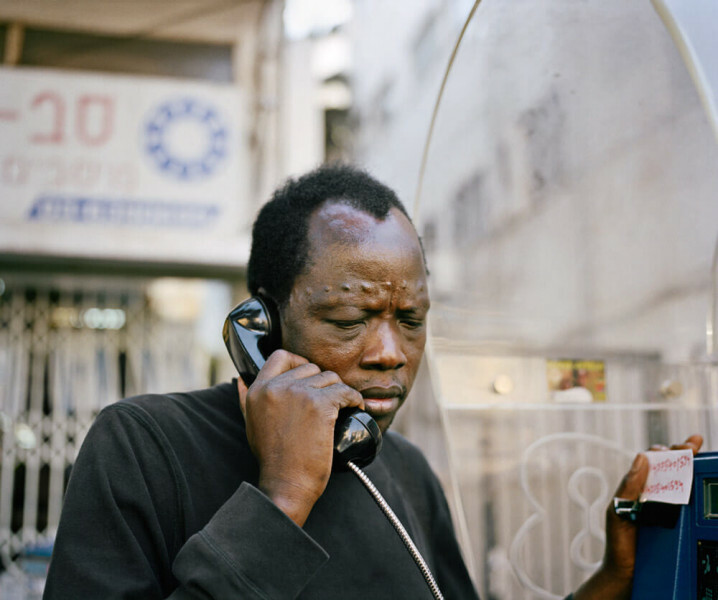 He spent most of the past decade living and working in Africa and the Middle East and now currently resides in Brooklyn, New York. 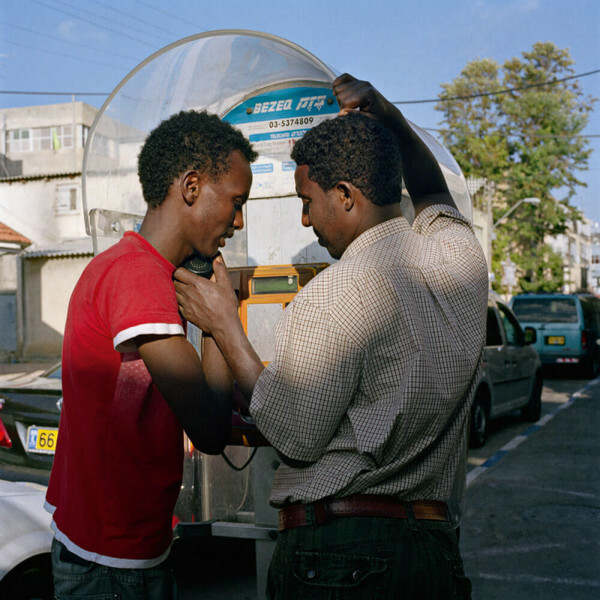 Carrier has an MFA in Photography from the Hartford Art School. 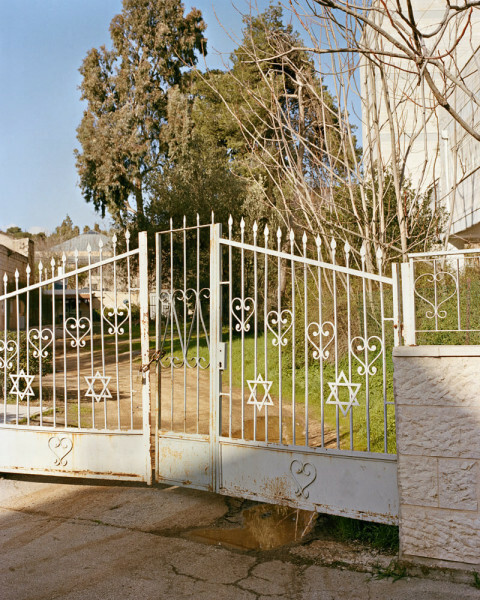 He was nominated for the 2012 John Gutmann Photography Fellowship and the 2011 Santa Fe Prize for Photography. In 2010 he was a ‘Director’s Choice’ in the CENTER awards, won first place in the Fine Art series, for the NYPH Photo Awards; and received an honourable mention in the Duke Center for Documentary Studies Photo Awards. His commissioned work has been featured in a variety of publications and media outlets including, The NY Times Magazine, TIME, Newsweek, Men’s Journal, National Geographic and CNN.